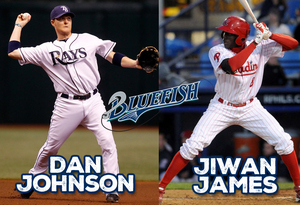 (Bridgeport, Conn., April 8, 2016) – The Bridgeport Bluefish today announced the signing of former MLB infielder Dan Johnson. Outfielder Jiwan James has also been added to the 2016 roster. Dan Johnson joins the Bluefish for his 15th season of professional baseball and first in the Atlantic League. Last year, the 10-year MLB veteran appeared with Memphis (Triple-A, St. Louis) of the Pacific Coast League and Louisville (Triple-A, Cincinnati) of the International League, as well as a 12-game stint with the St. Louis' big league club. The 36-year-old made his Major League debut with the Oakland Athletics in 2005, batting .275 that year with 15 home runs, 58 RBI and 54 runs scored in 109 games. He played three more seasons with Oakland before joining the Tampa Bay Rays, where he spent another three campaigns. He has also played for the Chicago White Sox ('12), Baltimore Orioles ('13), Toronto Blue Jays ('14), and St. Louis Cardinals ('15). Over the course of 443 Major League games, he owns a .234 batting average with 57 home runs, 203 RBI, and 179 runs scored. Johnson began his professional career in 2001 after being selected by the Oakland Athletics in the 7th round of the MLB draft. In 1,361 career minor league games, he owns a .281 batting average with 254 home runs, 274 doubles, 944 RBI, and 803 runs scored. Jiwan James joins the Bluefish for his Atlantic League debut during his ninth year of professional baseball. He was briefly a member of the Bluefish last season, but was signed by the Detroit Tigers organization before reporting for spring training. In 2015, the outfielder appeared in 114 games as a member of Lakeland (High-A, Detroit) of the Florida State League, where he collected a .249 batting average with seven home runs, 31 RBI and 56 runs scored. The 26-year-old has spent most of his career in the Phillies organization, reaching as high as the Double-A level in 2014. Over the course of 580 games, he owns a .262 batting average with 24 home runs, 192 RBI, 312 runs scored, and 109 stolen bases. James was originally drafted as a pitcher by the Philadelphia Phillies in the 22nd round of the 2007 MLB draft. He spent only one year on the mound before an injury forced the five-tool prospect to convert to the outfield. In a corresponding roster move, the Bluefish have placed infielder Luis Exposito on the reserve/retired list.